Cannes 2010 – Shekhar Kapur’s Paani is finally all set to roll! Yes! F-I-N-A-L-L-Y! Aur mere aankhon me khushi ke aanson aa gaye! Great for him and good for us becuase we cant take any more flooded timelines with his Paani tweets! It was offcially announced at the ongoing Cannes Film Festival where Shekhar Kapur is on jury. Click here to read the full report by The Hollywood Reporter or scroll down if you are interested in knowing only the key points that matter. Plus pic and a video attached. 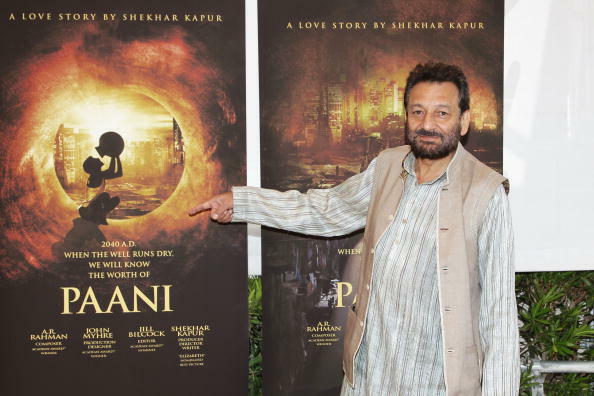 – Shekhar Kapur will direct “Paani” (Water) and the script is by David Farr. – The budget of the film is $30 million and is produced by Swarovski Entertainment and Adlabs founder-turned-producer Manmohan Shetty. – Kapur plans to shoot in November with additional backing from Walk Water in Singapore, Dubai and on large purpose-built sets being designed by John Myrhe. – The project also marks the first full-length feature backed by Swarovski’s start-up entertainment arm. – A R Rahman is on board as the music director and has already composed two songs for the project. – Its a love story set in a mega city in a future where precious H2O has all but run out and corporations go to war over its control. The city is divided into two conflicting halves, in which the upper city hoards all the water and drip feeds the slums of the lower city. A girl from the upper tier meets a water rat boy and falls in love against this backdrop. – “Blue Covenant” author Maude Barlowe is aboard and hopes Kapur’s film will play a part in taking awareness to a whole new level. Danny Boyle will also get producer’s credit. I hope for his sake he’s not going down that path. Or if he is, let’s hope he can change this POV. BTW, such lousy posters. He needs to cast Imran Khan in this so he’ll get ‘I hate luv storys’ level posters, which – as the world knows – are the apogee of design and artistic expression. This is incredible news … Shekhar Kapur is a visionary and I am quite sure he’d pull off a post apocalyptic story without stooping to shameless commercialization. hey who’s the hero hrithik?r those rumours true?and the heroine better be a new face very indian and traditional to give it a realistic aura…..
Aishwarya Rai@Cannes 2010 – Yes, she does it again(pics)!